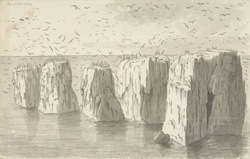 A view in ink of the rocks known as the Pinnacles, which give Pinnacle Island its name. It is one of the Staple or Farne Islands, off the Northumberland coast, formed by the Great Sill Whin volcanic intrusion. Volcanic deposits give the islands their characteristic charred colour.